Msirae Faythung is a Nord warrior added by the Mehrunes' Razor official plug-in. He was Mehrunes Dagon's champion, but failed Mehrunes while trying to accomplish some unknown task. As punishment, "The Kyn" (Dremora) carved his chest open with Mehrunes' Razor and doomed him to stand statue-like in the Nefarivigum and guard Mehrunes' Razor. He will awaken when anyone attempts to retrieve Mehrunes' Razor and must be defeated. The most notable item on Msirae is his beating heart. One way to retrieve Mehrunes' Razor is to take the beating heart from Msirae and eat it (which will increase your Infamy by four points, infect you with the diseases Porphyric Hemophilia and Cannibal's Prion, and awaken Msirae). If you choose this option (as opposed to prying apart the bars guarding the Razor), Msirae is weakened by the fact that he no longer has a heart, and will eventually die without any action by you (although he will be attacking the whole time, so killing him more rapidly may be advisable). He is equipped with a leveled Daedric war axe (leveled to do less damage than a standard Daedric war axe below level 20); the war axe can not be looted because the minute you try to pick it up it "crumbles to dust in your hands". 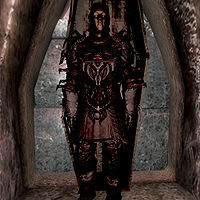 He is wearing mostly Dremora armor except for his gauntlets, which are Daedric (but not lootable due to his entire body disappearing upon death). He also carries a total of six potions or poisons. Msirae knows one summon daedra spell, heal minor wounds, as well as an ability "Dagonic Cast" that gives him resist normal weapons 20%, magic 20%, and poison 100%. Whilst also surrounding his body in a red aura. Once Msirae is dead, you are free to take Mehrunes' Razor and complete the related quest.